It’s true. I’m not an expert on potty training, and I only have two children. But I’m a real mom, and this is how I did potty training before 2 for both of my kids. My two children potty trained themselves before age two. I did not push them to do it, I simply followed their lead and encouraged them once they showed me they were ready. There was no taking my toddler every 10 minutes to sit on the potty (that sounds like torture). There were minimal accidents and no 2-year old power struggles. 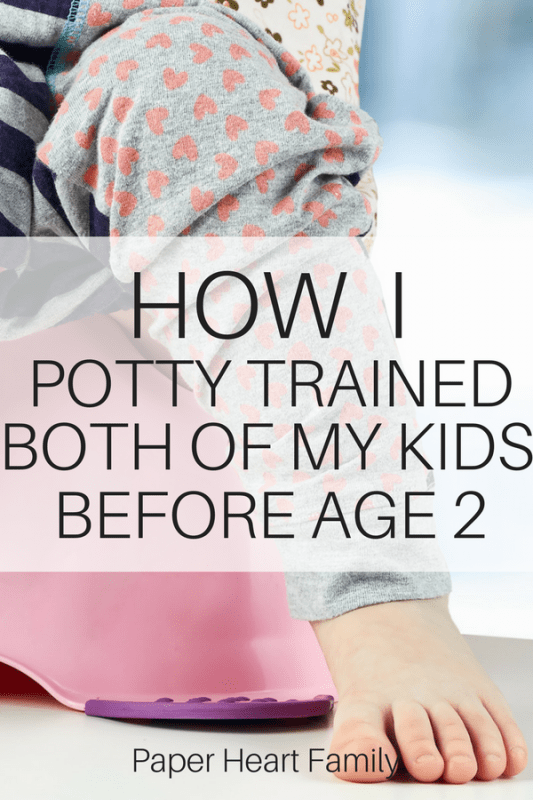 Everything else is currently a power struggle at age 2 with my youngest child, but potty training wasn’t. Although I cannot guarantee that my suggestions will work for every child, I do feel that there are definite ways that you can encourage early potty training. Preparing for potty training using these super simple steps will save you and your child a lot of frustration. Just imagine not having to buy any more diapers. I know, sounds amazing, right? 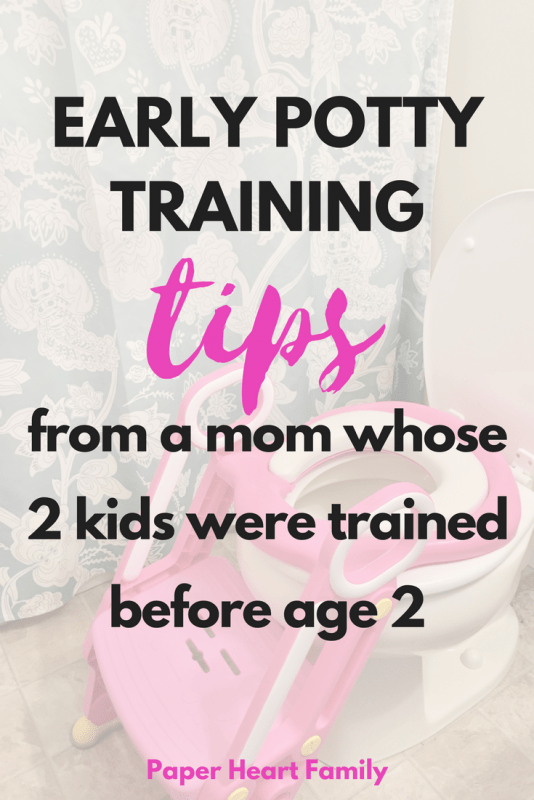 These tips work best when started early on, and will show you how to potty train by age 2. What you want to do is to make your child dislike the feeling of having a dirty diaper. If you clean your child up right away every time, chances are she will start to dislike the feeling, and want a clean diaper. This will help your child become aware of what is happening with her body. If your child has access to a potty, she will have the chance to explore it, and it will be normal and nothing new. Or better yet, get this toilet step trainer with ladder . My second daughter is extremely independent (and thinks she’s 10). She absolutely would not sit on a “baby” potty. I had to lift her onto the toilet (and hold her there so that she wouldn’t fall in). With this seat, she can safely get up on the potty all by herself (and I don’t have to clean out a baby potty!). You could also check out the My Size Potty. It’s a miniature toilet, complete with flushing sounds and a wipe dispenser. Kids are fascinated with bodily functions. Encourage your baby or toddler to become interested in using the potty by reading about it. We have two books about using the potty. Where’s the Poop? is a lift-the-flap book that will have your child laughing and realizing that everyone (even the animals) poops! P is for Potty! is another lift-the-flap book that any Sesame Street fan will love. We also have this drink and wet doll from Melissa and Doug . Both of my children are obsessed with it, even after being trained. Okay, so this might be a silly tip because if your house is anything like mine, no one EVER gets a chance to go to the bathroom in private. Are there children who actually give their parents privacy in the bathroom? If not, just think of it as a potty training aide. Letting your child see you going to the bathroom makes it normal (and something that cool grown-ups do). It’s pretty much impossible to miss the moment that your baby or toddler poops. So LABEL IT. Give it a name so that your baby can start to realize that something just happened. You also want to smile and keep it positive. You never want your child to be ashamed of going to the bathroom. I know, it’s so tempting to say something like, “EWWW!!! YOU STINK!! !” You can still say that, but watch your tone. Say it in a high pitched, playful tone, not a disgusted one. My second child went through a period of being disgusted when she would poop. There was nothing that we did to prompt this, she simply did NOT like the sensation. I simply reminded her that everyone does it. I asked her every time that she had to go if mommy, daddy, sister, grandma, etc. did it, and I believe it helped her to get over her fear faster. If you are wondering how early to start potty training, all you need to do is to watch your toddler for their window of opportunity. A lot of moms that I know have children that use the potty inconsistently, or that did but no longer do. If your child is showing you that she is interested, you need to take advantage! Both of my children (around 18-20 months old) started pulling at their diaper when they peed. If your child pulls at her diaper, even if your child’s diaper is already wet, sit her on the potty so that she starts to relate that sensation with the potty. This is the biggest reason that I have had success getting my children to potty train themselves. It’s difficult for a toddler to realize that she has to use the potty while wearing a big, bulky diaper. Your child will be much more likely to let you know that she needs to go if she is naked. Once your child starts pulling at her diaper or telling you that she peed, start letting her go naked. And if you’re worried about your child being cold, these baby leg warmers are the best (and so cute). For my first child, even after she was consistently using the potty, putting underwear on her caused her to have accidents. My second child did great even with a diaper on when we were out and about. Will your child have accidents? Maybe. Just keep your eye on the prize, mama. Potty trained= a diaper free baby and more money in your pocket! Do you think potty training before 2 is possible with your toddler? Great tips! I feel like I barely went through this phase because my son was in daycare full time and his teachers were amazing. They usually start a little before age 2 and have a group of kids training at the same time which results in positive peer pressure☺. His teachers started on a Monday and I think the kids were all trained (for the most part) within the week. They also did ‘no diapers’ from the get go and I think that helped the most. 1- A diaper is still necessary at night and nap, right? 2- How do you do in public bathrooms, any tips? 3- I really believe the intensive training is better than a long one, so once I potty train at home that means no diaper when we go out, right? What is your experience on accidents outside the house? Thank you so much Carol for the kind words! I’m so glad you found my tips helpful. I definitely still use a diaper for night and naps. Nighttime training is kind of separate from daytime training, and while my first child nighttime trained right around age 2 also, that meant that she woke up in the middle of the night to pee. Not very fun, so I am just fine with the fact that my 2 year old is still wearing a diaper. My mother-in-law actually puts her down for naps with just a pad under her, but I put a diaper on her for naps. She’s starting to get a little offended. For going out in public, in my experience my kids do better when we’re out. When we are home, they sometimes don’t want to stop to pee, but when we’re out, they love using a new bathroom. Automatic flushers, soap dispensers and faucets are fun! I just purchased a puddle pad for the car and make sure to ask her if she needs to go before we leave. I think that putting a diaper on to go out could be confusing, so I would try to avoid it!! Good luck and let me know if you have any more questions! Carol had a lot of the questions I was wondering about as well. I heard about the “let them go naked” technique so I this summer, I am going to try it out. The naked technique worked SO well with my first. I think it helps then to be more aware of their bodies. These are great tips!! We used a lot of the same ideas when I potty trained Luna … and Stella’s only four months but I already put her on the potty before bathtime – and a lot of times she’ll pee! I feel like just making it “normal” from a really early age helps so much! I agree, Lacey! That’s awesome about your 4 year old! I never thought to start that early, but what a great idea, to like you said, make it normal.